As the weather cools I find myself craving comfort foods! And there is nothing more comforting than these perfectly tender, mouth-watering pork ribs. Country style pork ribs have always been one of my favorite cuts of meat. They come out so tender and flavorful. Granted, as cuts of meat go, they have a higher fat content so I don't make them frequently. I'm a fan of intuitive eating so I don't cut foods like this out of my diet. Everything fits! When I make a fattier cut of meat, I like to pair it with lots of veggies and healthy grains! These pork ribs are sweet and savory so they have a flavor profile that is complemented by just about any side dish. Try them over sauteed cabbage and onion or with sweet potato! Yum! As you can see in the pic below, we had our pork ribs with quinoa and arugula. Give it a go and let me know what you think! Rinse the pork ribs and pat dry. Season the ribs with garlic powder, salt, and pepper. When I season meat I eyeball the amount, just enough to lightly coat both sides. If present, remove the stems from the sage leaves. Using your hands, crush the sage leaves into a coarse powder. If the sage is still moist, use a knife to cut. Press the sage into both sides of each rib so it sticks to the meat. 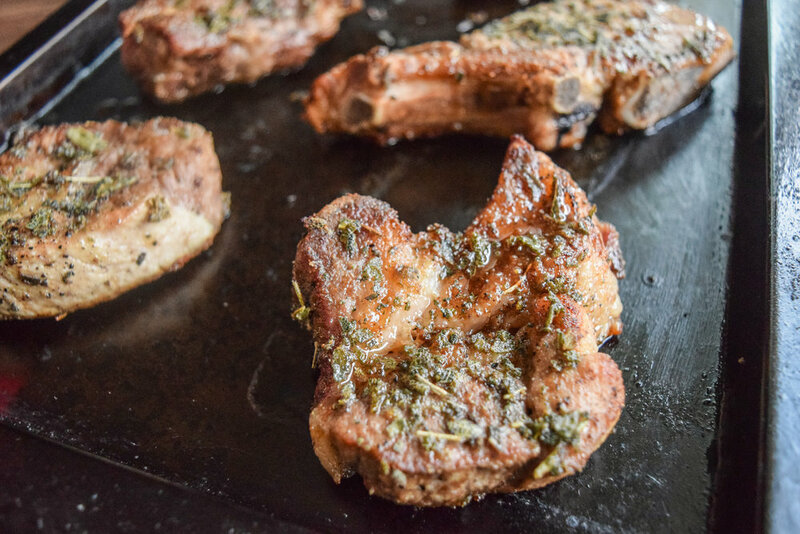 Heat a large skillet or grill pan over high heat. Pour in 2 TBS of olive oil. Allow the oil to heat for about 1 minute. Place the pork ribs in the pan and pan fry for about a minute to minute and 30 seconds. The meat should appear golden brown before flipping to the other side. Pan fry the other side for another minute to minute and 30 seconds. Remove the meat from the pan onto a cookie sheet. Top each pork rib (only the side facing up) with a sprinkle of brown sugar (~ 1/2 tsp). Place in the oven and cook for 20 minutes. If you cut into the meat it should appear cooked through and the juices should run clear. If you have a thermometer it should register 145 degrees Fahrenheit.